So far this year I have been working on one single drawing. 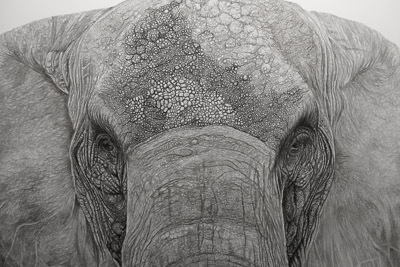 It is my largest drawing to date at 100 x 70 cm, and is of six different animals. Provisionally titled 'Procession' it has been an enormous challenge in many different ways. I am confident it is my finest work to date. All the good signs are there, primarily the struggle I have had with it - I feel my best drawings rarely go smoothly the whole time, and this drawing has had a great deal of time to go up and down. I've loved it and hated it in almost equal measure but it's almost finished, and I hope it will be a case of quality not quantity for my output this first third of 2016. My current plan is to have it for sale as the centrepiece of my BBC Countryfile Live display. I will soon be starting work on some British Wildlife drawings which I had wanted to do for some time before work on my Counting Lions book and 'Procession' began. On my list are Hare, Foxes, Badgers, Otters, lots of Birds of Prey, Polecats, Deer, small birds....the list is long and time is short. Such is the struggle for an artist with a young family and normal life to fit in between drawing!